Ok, so yesterday, I did some sponge activity with my rainbow nails.. and I like to think I am pretty deft with a sponge/gradients. I wanted to do a circular gradient.. I honestly tried it.. oh.. 3 times? Nada. Then I went with a different combo of colours.. wasn't having it. It was getting extremely upsetting. 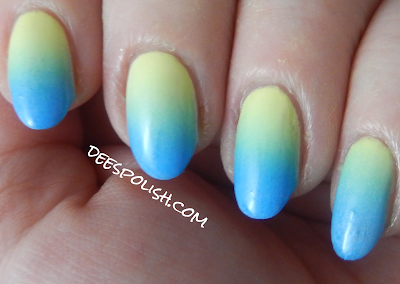 Finally I decided on a simple 2-polish gradient.. and it is the base for some nail art in a couple days.. Ugh. Oh, and only a 4-finger photo.. I screwed up the thumb so badly. It was not my day to gradient. Do you ever have those days when trying to do your nails? You can see the end product in your mind, but you are never getting there. Tomorrow shall be better.. right?